At Dental Center of Jacksonville, maintaining the comfort and relaxation of our valued patients is always a top priority! That’s why Dr. Jignesh Patel has invested in enjoyable amenities and comfort-based technology – we want you and your family to feel at ease during each and every appointment. Contact us today to schedule your first visit, or if you have any questions or concerns our team can help you with. Extra-strength, flavored topical gel is precisely administered to your gum tissue at the site of the requested treatment. The gel has a very fast and effective result, allowing patients to receive the follow-up injection of anesthetic without any uncomfortable “pinching” sensation. Our DentalVibe technology essentially “tricks” the patient’s brain by administering fast vibrations to the injection area. You’ll be so distracted that you won’t even realize the actual injection is happening until it’s already over! Our anesthetic is precisely warmed to match your body’s internal temperature and pH, which means that the body won’t react to it as a foreign material (which is the source of most injection pain) and will stay calmer overall. In addition to these advanced processes, every member of our team is well-trained in helping patients manage their anxiety and feel well taken care of throughout their appointment. Sedation dentistry is available as well to help take the edge off common feelings of nervousness or fear and replace them with a sense of ease and comfort. With the help of spa-like amenities, we hope our patients can look forward to relaxing during their appointments as our doctors and team members improve their oral health. 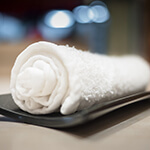 A pleasantly warm facial towel offers a great way to freshen up once your treatment is complete. Then, you’re free to show off your improved smile to the world around you! Feeling thirsty before or after your appointment? Our beverage bar is always available, offering ice-cold water, quality coffee products, and other tasty drinks that can give your day a much-needed boost. The dentist’s office shouldn’t have to be a sterile, formal place – we want you to feel right at home during each and every visit. 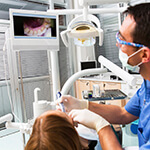 For some patients, being able to stay distracted during their dental care is a big help. If you’d like, our Jacksonville team will be happy to provide you with an Ipad to enjoy over the course of your appointment that’s outfitted with Bluetooth, headphones, and Netflix for watching your favorite movies and TV shows! As our doctors improve your smile, something as simple as a favorite song can help positively enhance your treatment experience even further. Headphones are available upon request, as well as Pandora! This customizable radio station allows you to submit your favorite artist, genre, or song and then builds a set list that’s perfect for your unique preferences. We enjoy helping our valued patients feel right at home when they’re at Dental Center of Jacksonville. If you’re cold or uncomfortable in any way while sitting in the dental treatment chair, ask one of our team members to get you a blanket to wrap yourself up in. You’ll feel comforted and nicely warm as your smile’s health and beauty is improved. Sometimes, patients can struggle with holding their head/jaw in one certain position for an extended period of time, especially if they’re undergoing a more complex procedure. Neck pillows can provide a comfy cushion in these instances – and they’re nicely scented as well! If you’d like to block out the sights our dental office and be at peace with your thoughts, dark, protective eyewear is also available upon request. Our team is proud to use the Isolite® System to help patients feel even more at ease throughout their treatment. We’ll provide a soft mouthpiece that effectively shields the patient’s tongue and cheek while also giving them a comfortable way to rest their jaw. Liquids and saliva can be suctioned out more effectively as well, and illumination from inside the mouth makes treatment speedier. Our goal is to keep you relaxed, fear-free, and surprised when your appointment’s already over! Sometimes, one of the main sources of anxiety for patients is that they’re not fully understanding the issues they’re experiencing with their oral health and what our Jacksonville team is doing to correct them. We believe that you should know exactly what we know, and that’s why we use advanced intraoral cameras to give you a personal tour of the inside of your mouth. With these high-resolution images, helping patients become full partners in their dental care journey has never been easier! Are you or a family member experiencing a dental emergency that needs immediate attention? Contact Dental Center of Jacksonville right away for the immediate, supportive attention you need. We welcome walk-ins and will provide same-day treatment for much-needed relief. Our extended evening and weekend hours are also great news for even the busiest of schedules!